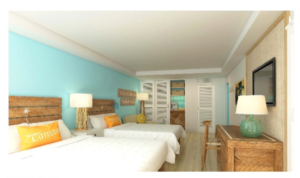 Grand Cayman, CYM – June 8, 2016 – The first renderings and amenity details of the highly anticipated Margaritaville Grand Cayman Beach Resort were released today. The 285-room beachfront property, set on the picturesque Seven Mile Beach, will be an ideal addition to the Caribbean and the company’s rapidly expanding resort division. Margaritaville Grand Cayman Beach Resort (rendering left) is located in the heart of Grand Cayman, minutes from the island’s top attractions including snorkeling, diving, shopping and golf. The property, inspired by the lyrics and lifestyle of Jimmy Buffett, will reflect the warm, authentic Caymanian hospitality consistent with the island’s well deserved reputation as the “World’s Friendliest Country.” The resort is expected to open its doors in December of this year. Margaritaville Grand Cayman Beach Resort will be consistent with Margaritaville’s ‘casual-luxe’ design, making it a perfect destination for anyone looking to escape, relax and have fun. 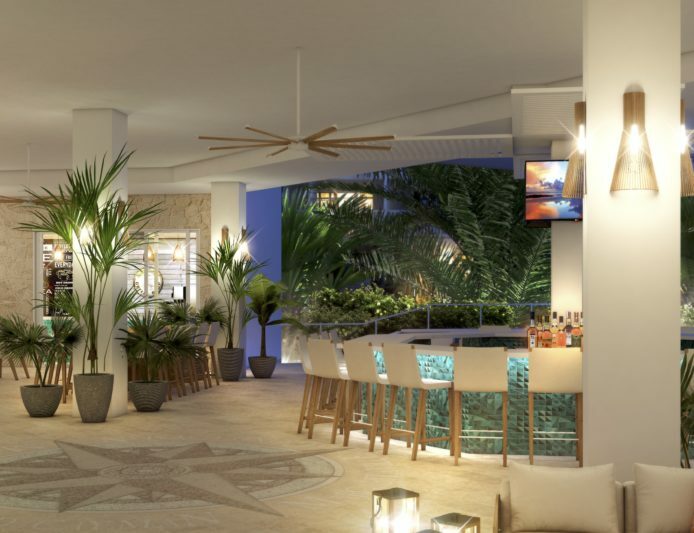 An open-air lobby with a soothing beach color scheme, comfortable lounge seating and a License to Chill bar (rendering right) immediately puts guests in the vacation state of mind. Margaritaville Grand Cayman Beach Resort’s restaurants and bar venues will be a welcome addition to the island’s emerging dining scene. In addition to the License to Chill lobby bar, the beachfront resort will be home to a Margaritaville Coffee Shop, a three meal-a-day Banana Wind Café with panoramic ocean views, a swim–up bar at the main pool and a charcuterie. The property’s signature restaurant, YARA, which means “place” for the Caribbean’s Indigenous Taino people, will be a dining destination for resort guests and locals alike. Additional details about the on-site amenities, services and facilities at Margaritaville Grand Cayman Beach Resort will be announced in the coming months. This will include plans for the resort’s 285 guestrooms; dining and function space renderings and floor plans; details on the resort’s two-pool layout including a tranquility pool and activity pool, as well as information on the gym, spa/salon and the location’s 1,500 square feet of retail space. Margaritaville Grand Cayman Beach Resort is owned and developed by HHG Cayman Ltd., a division of HHG Holdings, a Cayman Islands-based international hotel investor, developer and operator. For more information, visit www.margaritavilleresortgrandcayman.com.